If you’ve never seen one of these before, the above ‘tuner’ is a pitch pipe. The way it works is you blow into it and it sounds a note you would then try to match with your guitar. It was horrible to use and frustrating as a beginner to try and get all six strings to match the raspy tone of the pipes. Not only that, but it wasn’t very accurate either – I remember the pitch changing based on how hard I blew into the pipe. To see one in action, check out the video at the end of this guide. Fortunately technology has improved significantly from the dark-age era technology I used as a child. The guitar tuners available today are incredibly accurate, easy to use and very affordable. When you compare the accuracy and different features of the guitar tuners in this guide, remember back to the awful pitch pipes I had to use and be glad you don’t have to deal with anything like that. There are so many different options available so in this guide I’ll give you my top recommendations for the best guitar tuners out there as well as help you figure out which one is right for you. While something as basic as a guitar tuner might seem like a simple purchase, there are a few things you should consider to make sure you get the right one for you. You only realize how important the screen brightness of a tuner is when it’s not bright enough. The first outside gig I had was on a hot Australian summer’s day without any shade. 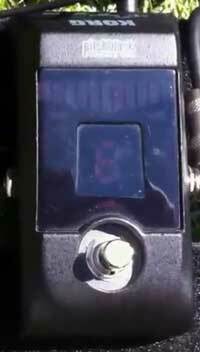 The LCD screen on my tuner looked like it was completely switched off thanks to the bright sunlight. I had to duct tape a makeshift cardboard cover over the pedal just to barely see the screen. The photo to the right shows how bad some tuners can be in direct sunlight. Most new guitar tuners are more than bright enough and some allow you to increase/decrease the brightness to suit your situation. So while this shouldn’t be a problem if you buy a recently released tuner, keep it in mind if you pick up something older. If you play electric guitar, a nice benefit of having a tuner pedal is being able to mute your signal on demand. An audience hearing you tune your guitar is the easiest way to look like an amateur. With a tuner pedal you simply hit the footswitch and it mutes your signal – allowing you to tuner your guitar in complete silence. Outside of tuning it’s still very handy to be able to mute your signal at any time. You can use your tuner to keep things quiet while you change guitars, stop ear-piercing feedback or to reduce the hum of your amp while you’re not playing. If you play electric guitar, I highly recommend getting a tuner pedal – even if your amp already has an inbuilt tuner. The accuracy of guitar tuners are rated in cents. There are 100 cents to a semitone so the note C# is +100 cent higher than the note C. For example the best-selling BOSS TU-2 has an accuracy rating of +/-3 cent. That means when the tuner says the note is in-tune, the real note might be up to 3 cent higher or up to 3 cent lower than what it says. It’s important to note that accuracy is important up to a point. Guitar fretboards are imperfect and it’s impossible to have a perfectly tuned guitar across the fretboard. The way you play also affects your pitch so even a perfectly in-tune guitar can sound out of pitch when you play it depending on how hard you push down on the frets. There is also a point where we cannot hear the difference between two closely tuned notes. Studies have found that the average human can only tell the difference in pitch when the difference between two notes is around 5 cent or more. This means you cannot hear a difference between a guitar that is perfectly in tune and a guitar that is 0.5, 1 or even 2 cent out of tune. The key point to take away is that the accuracy of essentially all modern guitar tuners is more than what’s needed. You don’t need to throw out your +/-1 cent tuner just because you’ve seen a +/-0.01 cent tuner. You won’t be able to hear the difference between the two. If a new pedal comes out claiming +/-0.01 cent accuracy, that’s marketing in action – it won’t make you sound any better than a +/-1 cent tuner. Some tuners use a buffered bypass, other tuners use True Bypass and some offer you the choice between the two. If you don’t know what these terms mean, read through my guide on Buffered and True Bypass here. The right option for you depends on how many pedals you have in your rig, whether you have other pedals that have a buffer and the quality of the pedals. The key principle with tuning your guitar is that the tuner needs a nice clean signal of the string. While some modern tuners work well in noisy environments or with sloppy playing, if you want an accurate tuning, you need to think about what you’re doing. As an extra tip, if you’ve tuned your guitar but it still sounds out while playing, check your guitar’s intonation by comparing the pitch of the 12th fret harmonic and the 12th fretted note. If the two are different, you need to adjust your intonation. 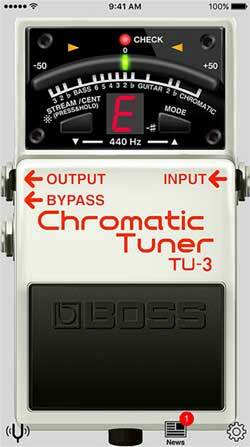 For many years the most popular guitar tuner pedal you could buy was the BOSS TU-2. It seemed to find it’s way on to almost every pedalboard and rig out there. While it’s still a fine tuner, there are better options available now. 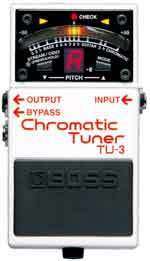 The easy option for many guitarists was the upgrade to the BOSS TU-3. It improved the accuracy of +/-3 cent from the TU-2 to +/-1 cent while adding in new modes and support for 7 string guitars. Check out the price and details of the TU-3 here. While the TU-3 is a great pedal, the TC Electronic PolyTune 3 is a significant step up. Even the first PolyTune was a big step up from what other tuner pedals were capable of. The PolyTune 3 is incredibly fast and accurate with +/-0.5 cent accuracy on chromatic mode and +/-0.1 cent accuracy on strobe mode. The polyphonic mode allows you to strum all strings on your guitar at the same time and instantly see which strings need adjustment. If you’ve never used a polyphonic tuner before, it’s a very nice feature to have. I’m sure tuners in the future will add more features and there are other pedals that are just as good as this one, but for now it’s an easy choice to make. 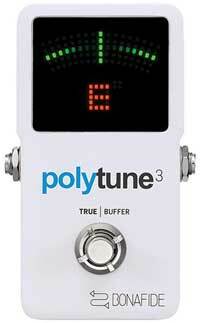 Check out the current price and details of the PolyTune 3 here. 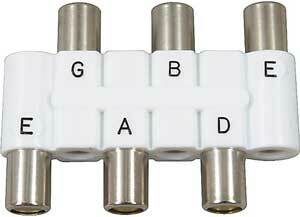 There are quite a lot of good quality clip-on tuners which are ideal for acoustic guitarists. They can also work for electric guitar so if you play both, a clip-on tuner is worth having. The big benefit of clip-on tuners, when compared to handheld tuners, is they’re much more effective in noisy environments. Because the tuner senses the pitch based on the vibration from the guitar, it’s not going to get confused by ambient noise. 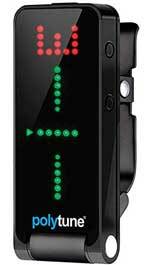 Possibly the best clip-on tuner is the TC Electronic PolyTune Clip. The reason this tuner stands out is that it offers the same polyphonic, chromatic and strobe modes seen in the PolyTune pedal. With polyphonic mode you strum all strings and can instantly see which strings need adjustment. Then you simply go through each string one at a time in either chromatic or strobe mode depending on your preferences. The strobe mode is rated at +/-0.02 cent accuracy which is as good as it can get. A handy feature is being able to save your preferences for tuning modes. Let’s say you prefer using the strobe tuner and you tune your guitars to Eb. You can save both modes so any time you use the tuner it automatically starts in strobe mode with Eb tuning. Check out the current price and details of the PolyTune Clip here. For most guitarists it makes sense to have either a pedal or a clip-on tuner. 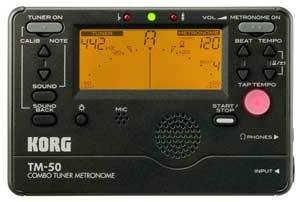 But if you also play other instruments that require tuning you may prefer a handheld tuner. The big benefit with these tuners is that they’re incredibly cheap. The Korg TM-50 Tuner and Metronome is one of the best handheld tuners available and as you may notice from the name, it also has an inbuilt metronome. Being able to plug in an electric guitar or use the microphone means you can use it for any of your guitars. While you can download a free tuner app on your smartphone, if you like the idea of having a dedicated tuner, it’s a very cheap way to get a tuner and metronome at the same time. Check out the price and details of the Korg TM-50 here. If you don’t use a pedalboard when playing live and use rack gear instead, there are a few options for rack tuners. If you want the best and don’t care about the cost, one of the highest rated rack tuners is the Peterson VS-R StroboRack. For everybody else who doesn’t want to pay that much for a tuner, the Korg PB05 Pitchblack Pro Rack Tuner is possibly the most popular rack tuner available. If you use both rack gear and pedals, think about whether a pedal or rack would suit you better. 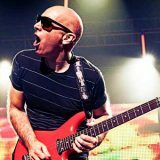 For example do you want to be able to tune or mute your guitar easily while on stage or would you prefer to tune your guitar offstage between songs? While the first few generations of automatic tuners were pretty disappointing (Gibson’s Robot guitars come to mind), technology has improved to the point where automatic tuners are actually worth checking out. 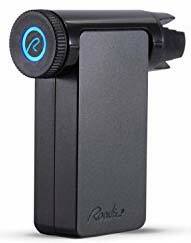 The Roadie 2 is a small and lightweight automatic tuner for electric and acoustic guitar, as well as ukulele, banjo and mandolin. Simply select the type of instrument, select the tuning you want and hold the Roadie against your tuning pegs. In my full review of the Roadie 2 I go through how it works, what you can do with it and why automatic tuners aren’t bad like some people claim. 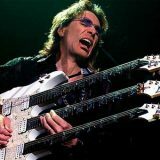 It’s an incredibly impressive piece of technology that can make your life easier – especially if you have multiple guitars or regularly use different tunings. While I still recommend most electric guitarists buy a tuner pedal, having a Roadie 2 has been extremely handy for me and definitely worth checking out. 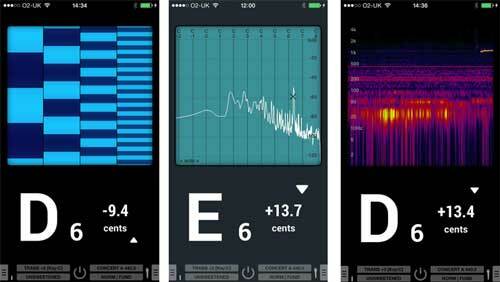 If you have a smartphone or tablet, you’ve probably downloaded one of the many free tuner apps available. If not, get one now. Most of them are free and they’re incredibly handy to have. The downside with tuner apps is due to the fact that they use your phone’s microphone. The microphone is optimized for speech – not guitar. This means the app may not clearly hear your guitar and may give you an inaccurate reading. If you also play bass guitar the apps are going to struggle to properly detect the correct pitch. They may be able to give you a decent reading, but don’t count on it being as accurate as a pedal. Of course if you can plug your guitar into your smartphone with a device like the iRig HD 2, you will be able to give your tuner app a clear signal of your guitar for the best results. 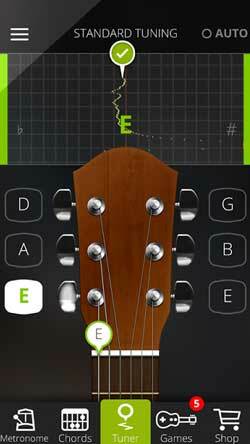 One of the most popular free apps is Guitar Tuna (iOS & Android). If you only play in standard tuning, then this app gives you all you need. If you need more flexibility then you’ll have to pay extra to unlock different tunings and features. This makes it very quick and easy to tune your guitar and would be a great option for beginners. 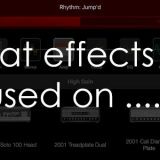 I personally think it’s strange to make an app look and act like a pedal when there are far better ways, but it’s a nice free option that may suit a lot of guitarists. While this is a more expensive option that most other apps (plus there are a lot of in-app purchases available), it gives you plenty of flexibility if you want something more than what the free or cheap apps offer. There are a lot of other apps available so download a few and see which you prefer. No. While it could be argued that pitch pipes help with ear training and developing a sense of pitch, just don’t do it. Get a real tuner and work on ear training separately. If somebody tells you that “kids these days can’t even tune by ear”, that person is probably just annoyed that they had to put up with bad quality tuners or pitch pipes when they were learning. As an experienced guitar teacher I can confidently say that you’re not going to learn anything from pitch pipes. If you want to develop your sense of pitch (and you should), look into ear training. A set of pitch pipes won’t teach you anything because without a guitar tuner you won’t even be able to check how close you were to the correct pitch (which is crucial for ear training). You could even develop horrible pitch sense if your pipes aren’t perfectly in tune. So you can see why pitch pipes are so bad, if you have a handheld tuner or a tuner app on your smartphone hold it up to your speaker when he blows into the pipe. What you’ll notice is that the pipes are horribly out of tune. This is why the chord he plays at the end sounds out of tune – the pipes were out of tune to begin with! Most of the pipes are out by around 3 cent while one was out by around 7 cent! Key point to remember: sometimes the good old days weren’t that good. Playing a well tuned guitar is crucial for your ear development and for anybody listening to you. Check out the best guitar tuners in this guide to find the right one for you. What Guitar Effects Are Used On This Song?